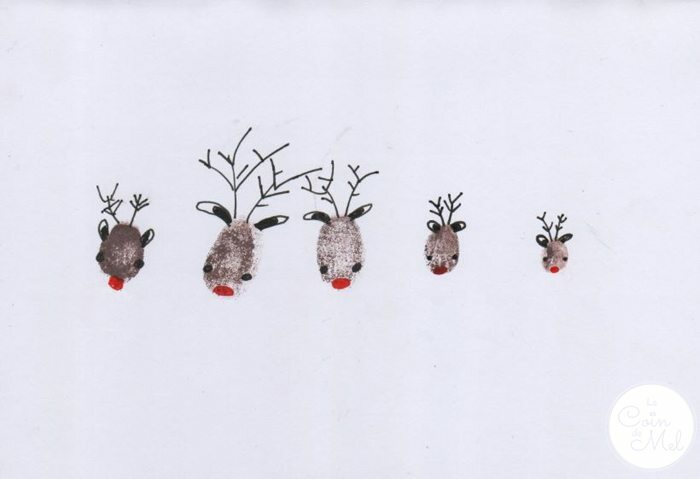 If you have come across my little blog before, you might be aware that although I absolutely love all things crafty, I am also useless at drawing. 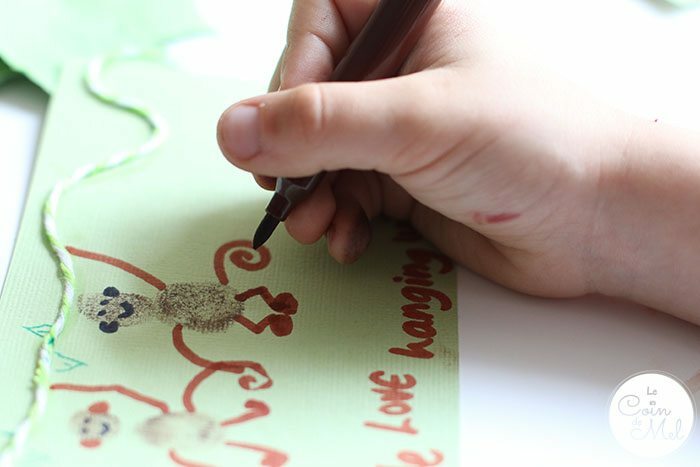 One thing I find pretty effective when making cards with the children is going for fingerprint art. 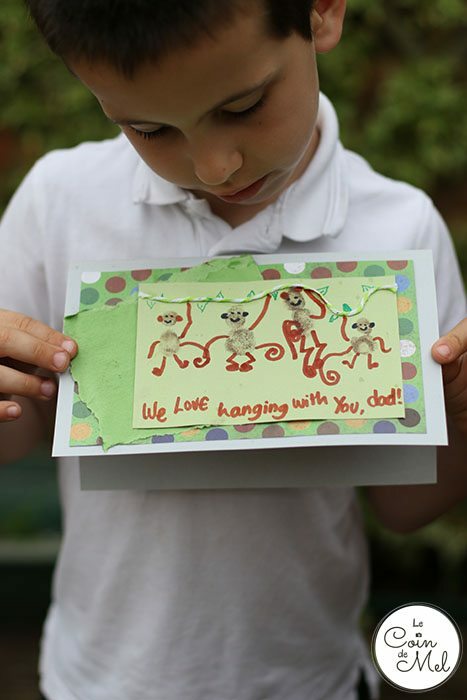 When Bostik challenged us to create something following a ‘jungle’ theme, we had no idea what to do, then I remembered a card Crevette made at school a couple of years ago for Father’s Day. It had simple painted monkeys swinging from vine to vine. 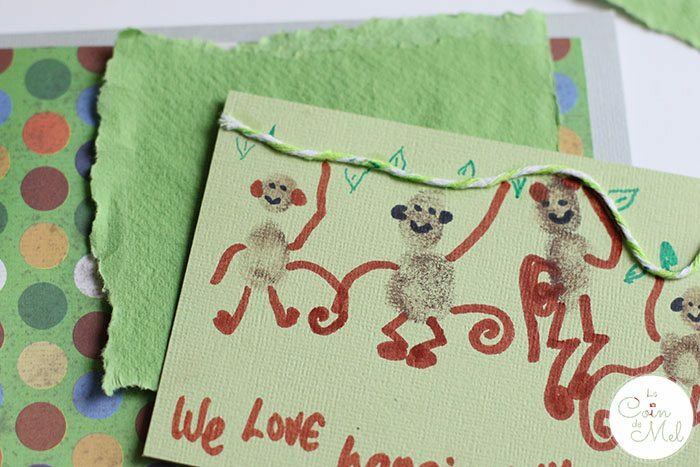 I had an epiphany: we would be making our own fingerprint monkeys! 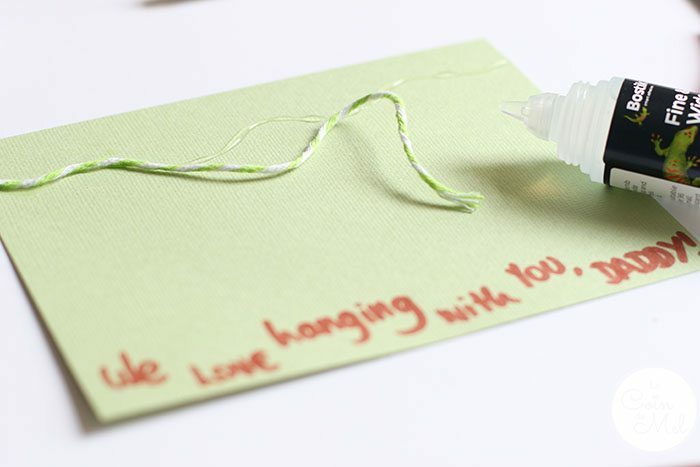 Using the fine end of the Glu Pen, draw a curved line of glue and stick the string over it. 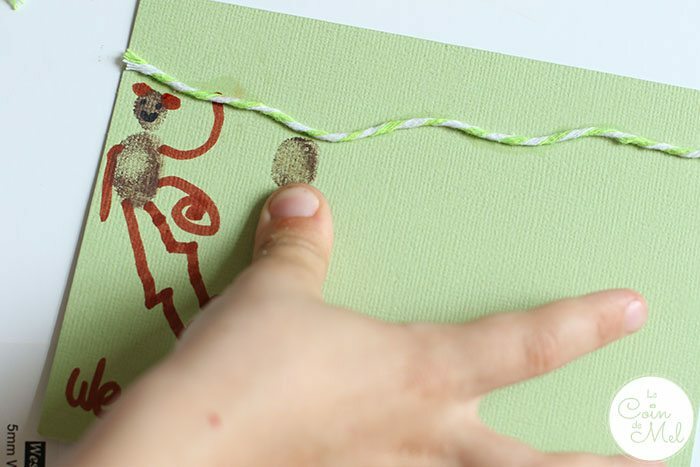 Get your little one(s) to make a little finger print near the string, and a larger thumb print directly under it. Help them draw eyes and mouth in black, then ears, arms, legs and tail in brown and leaves in green. Fold the A4 card in two so you end up with an A5 card. 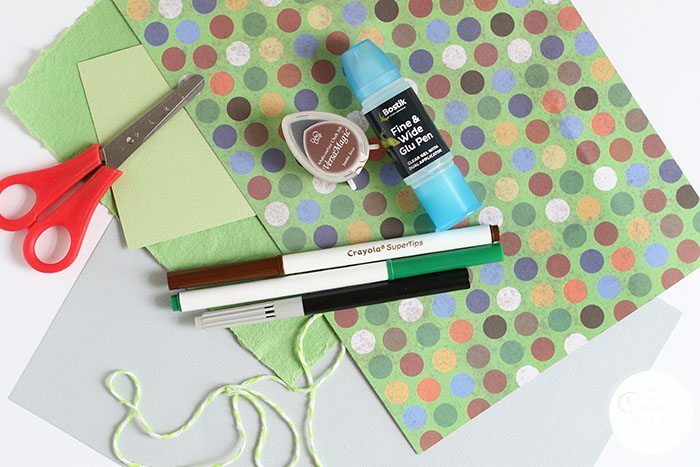 Layer the different papers to get the desired arrangement and stick, using the wide end of the Glu Pen. 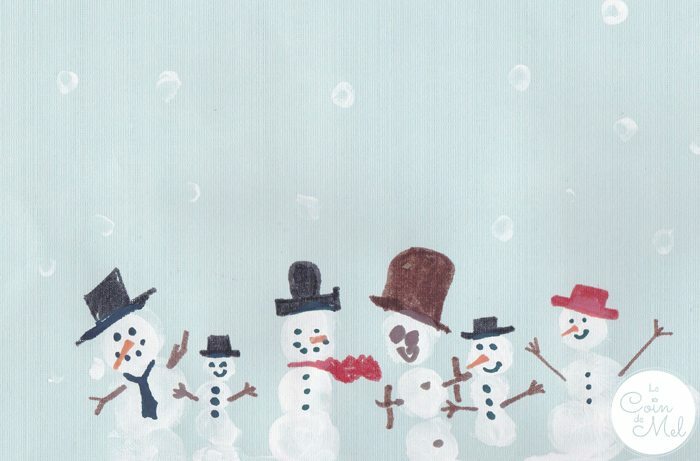 If you are looking for quick and easy activities to do on a rainy day with your children, why not try our bunny garland, hatching dragons, washi tape cards, toilet paper roll bunnies, reindeer lanterns, cute button card, paper cup dragon, finger painting, bath painting, thumbprint art, heart-themed crafts, an embroidered canvas , a stained-glass picture, cute caterpillars or even make your own play dough? Disclosure: Bostik sent us a selection of crafting supplies free of charge as part of the Tots100/Bostik Craft Bloggers’ Club. All photos and opinions are my own. What a sweet idea! I wonder if we could make fingerprint bears the same way? I think I might help my niece make one for her daddy this week. Thanks honey. Now we’ve got to find the cards. I hid them too well! c’est super beau! très bonne idée!!!! They’re perfect for nursery, aren’t they? Love a bit of fingerprint art. That’s all we can manage, he he! What a brilliant idea, I bet Daddy will love receiving that! Well, we’ve sort of lost the card… I hid it so well I can’t find it. Aaaargh! It is! That’s why I love fingerprint cards so much – you can really see the difference in their thumbprint sizes over the years. Such a great way to keep their thumbprints! Fingerprint paintings are ace! 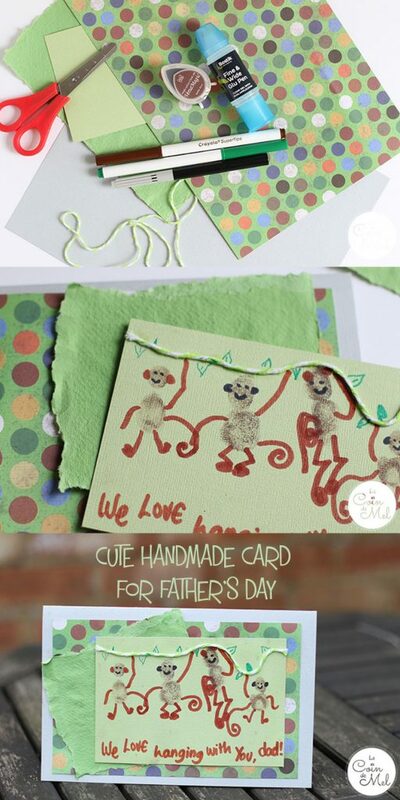 Not thought about making monkeys before, but that’s going on the to do list! Thanks lovely. The beauty of it is it takes no time to make and it fingerprint art usually looks good. Win, win!